AngularJS is a popular framework maintained by Google to simplify development and testing for the developers worldwide. It is an open source framework that provides great expressions through easy integration of HTML codes and application modules in the framework. It is built on MVC architecture, which is commonly used for building rich internet applications. Powered by Google, AngularJS is based on Java, which provides it diverse features and flexibility. Most frameworks require the programmers to split the application into different MVC components and then combine them using codes. With AngularJS, the developers need not write lengthy lines of code to combine different components. All they need to do is put the distinct MVC component together and rest all is taken care of by AngularJS automatically. The framework has a management interface and behaves as a pipeline among different components. AngularJS provides flexibility and prevents the developers from making any mistake by inserting the wrong code. Companies providing AngularJS development services have different programmers working on the same project. Every developer is given a different task and the work is divided as per the need. Sometimes, dependencies arise, which can be easily managed with AngularJS framework. It provides an option to break down everything into small controllers. The developers can segregate the code and test their own code independently. This is extremely helpful, especially in case of large projects, as it provides more automation and leads to better workflow and also helps in collaboration. If you are using AngularJS for your project, you are more likely to cut down your development time by automating the tasks that are repetitive in nature. This leaves the developers with some extra time which can be utilized to optimize the app and enhance its overall performance. AngularJS offers data binding and dependencies injection, which eliminates the need to write lengthy code. The dual way data binding allows the developers to code more in less time and it provides the best agreement between Model and View. Building an app using AngularJS requires less coding as compared to other frameworks. It automates most of the things, providing an option of code re-usability. The developers can code and copy it anywhere required. AngularJS framework supports all of the concepts of Object Oriented Programming (OOPS). This, eventually, saves a lot of time of the developers, allowing them to innovate and think differently about the project. AngularJS is one of the most useful frameworks for building cross platform mobile applications. 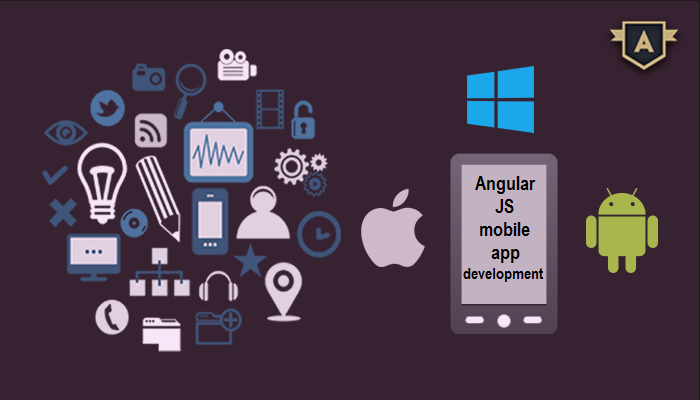 A large number of companies worldwide are offering AngularJS development services to build mobile apps for businesses. When it comes to the development of hybrid apps, developers usually need to use jQuery mobile framework, which makes things a bit complex, especially when the mobile app to be built has multiple pages. AngularJS, on the other hand, makes everything easy and categorized, making mobile app designing highly feasible. In addition, the framework allows the developers to use the code anywhere, without any edits and variations. AngularJS allows the developers to divide the application into logical modules which may have dependencies on each other, but are initialized separately. This leads to tactful and easy approach to testing by using only the modules that the developers are interested in. Understanding the benefits of AngularJS app development, if you are planning to embrace the framework to build your mobile app, partner with an experienced and trusted AngularJS mobile app development company that can understand your needs and transform your idea into a successful product.